(Newser) – An ex-money processing manager for Brink's Company in Alabama who had access to bags and bags of quarters swapped out coins for beads and made off with nearly $200,000 in 2014, per the FBI. Stephen Dennis, 49, has agreed to plead guilty and pay Brink's back for the money he's accused of stealing from the Federal Reserve Bank of Atlanta while he was working in the armored transport service's Birmingham branch (Brink's has already paid the bank back), NBC News reports. Per a Justice Department press release, Dennis allegedly entered Brink's on a day he wasn't scheduled to work in February 2014, took four of the empty ballistic bags in which quarters are stored (each bag holds $50,000 in quarters), and filled them mostly with beads, as well as with just enough quarters so the coins could be seen in a see-through window on each bag. 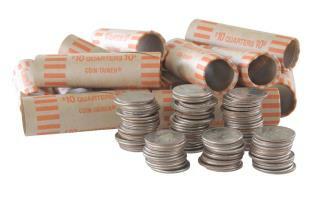 We had banks in our area who were keeping coin rolls in really shoddy containers that were basically just file cabinets. After several breakins, we finally stopped them of the practice. But they lost a lot of coins in the process. On the other side of the coin, Coinstar reported they were getting an inordinate amount of mint new coins at one particular Food-4-less that was frequented by the section-8 and access people in the area. So we pulled the footage from an ATM that was next to the Coinstar machine along with the store's footage. With that, we identified the suspects and got the conviction. Like a bank president once told me a very long time ago, "If you are going to steal from a bank or any company, make sure its a very large amount so you can just disappear." "One-arm-bandits HERE I COME!" Will the casinos be charged with money laundering?